• Stimulation of tissue regeneration. • United feverish, inflammatory processes and general infections. • Eyeballs and the front surface of the neck and scar tissue. 1. Galvanisation (galvanic current – direct current low frequency). Contraindications: general contraindications as electrotherapy. 2. Iontophoresis (current low frequency). In iontophoresis procedure is most often used galvanic current to enter the body through the skin of appropriate medication. For this purpose the various types of compounds undergoing electrolytic dissociation (acids, bases, salts). These are drugs in the form of solutions of various compounds of the gels containing the active substances or mineral water. • sports injuries, overloading joints and tendons. 3. Electrical stimulation (pulse current of low frequency): The purpose of this therapy is to provoke muscle contraction – muscle exercises, used in muscle rehabilitation is not diseased by spasticity, a muscle atrophy simple. Electrical stimulation is also used in cosmetic treatments. • improving blood circulation growing cells. Duration of the treatment for 5 minutes or 1-3 sets of 5-20 muscle contractions. 3a. Electrodiagnostics (direct current and alternating low-frequency): The aim is to explore the excitability of nerves and muscles in order to determine the parameters for electrostimulation. 4. Diadynamic (direct current and alternating low-frequency): These are currents that have the properties of stimulus currents of variable frequency and analgesic properties, and vasomotor stimulant of muscular DC low frequency. Through a combination of two frequencies and modulation amplitude arises 6 basic types of diadynamic currents (MF, DF, CP, LP, RS, MM). RS, MM – stimulates muscles in the disappearance of a straight or a slight paresis. 5. Trabert current / current ultra stimulus (DC-less component and a variable low frequency): This type of electrotherapy has a strong analgesic effect. It causes muscle tremors and vibrations causing muscle relaxation. This helps to increase the analgesic effect. Duration of treatment 8 – 15 minutes. • reduce stress and depression, and strengthen immunity. • fight not by healing the wounds, wrinkles, scars and muscle tension. • helping to fight with other disabilities. Duration of the treatment to 20 minutes. 7. Tonolisis (AC low frequency) is a muscle electrostimulation affected by spasticity. The treatment involves stimulating muscles stretched at the moment eliminated spastic muscle. 8. 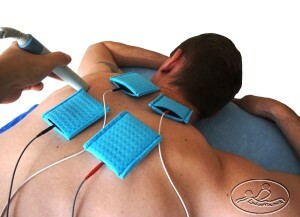 TENS (low frequency alternating current): This is a transcutaneous electrical nerve stimulation. It is a procedure used for the symptomatic treatment of acute and chronic pain syndromes. There are 3 main variations of this method: TENS Conventional, TENS APL – acupuncture, TENS Hipersytmulacja. Duration of the treatment 20 minutes. 9. Currents Nemec / interference currents (medium frequency alternating current): These are interference currents, or arising from the overlap of two or more waves, leading to the strengthening of the resultant wave. The procedure can be performed using the static interference field (static method), or dynamic (kinetic method consisting in the change in the duration of the procedure arrangement of electrodes). Depending on the used frequency is achieved other therapeutic effects. Indications for treatment with these currents, relate mainly to various types of muscle dysfunction (eg. Muscle atrophy, muscle dysfunction, reduced muscle innervation and others). This therapy is also used in soft tissue rheumatism, peripheral neuropathies, and in the initial period peripheral circulatory disorders. 10. Currents Kotz / Russian stimulation (medium frequency alternating current) treatment of these currents is done to stimulate muscle atrophy simple and as muscular training in athletes to increase muscle size and strength, and procedures modeling figure. 11. Combination therapy (combined). Electrotherapy (TENS, low-frequency currents, currents Nemec) can be combined in a single treatment with other methods of physical attributes, eg. With ultrasound, laser therapy or magnetotherapy. Combining the effect of the selected treatment produced a stronger therapeutic effect (analgesic, anti-inflammatory) in the tissues. Methods of performing the procedure is the same as electrotherapy and the associated physical treatment. Contraindications are the same as for electrotherapy and the associated physical treatment. 1. A. Bauer, M. Wisp, Methodological Guide After surgery Selected physical, ed. Markmed Rehabilitation S.C., pp. 37-189.